The FOMC is set to meet again this week. The committee is not expected to alter policy but there is a growing expectation the individual members will alter their growth forecast. This meeting the members are expected to lower their dot-plot targets for this year and next, effectively ruling out another rate hike in 2019. What is the dot-plot? Only one of the most heavily watched indicators of Fed activity. The dots are where each member of the FOMC thinks interest rates should be, the plot is over the course of two years, which gives a pretty good indication of how each member will vote and where rates are heading. The Dollar Index is sure to move on the FOMC news but which way is always a question. This month, along with the policy statement, there is a press conference that usually adds a bit of volatility to the market. 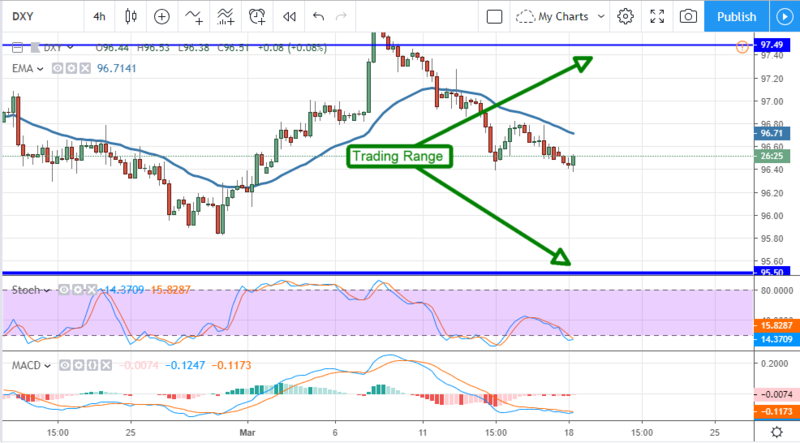 The DXY is trading smack in the middle of a trading range with uncertain indications that point to one thing; range bound trading. Even if the index does make a significant move it is likely to be constrained by support or resistance targets. The trading range is between $95.50 and $97.50 and not expected to be breached. 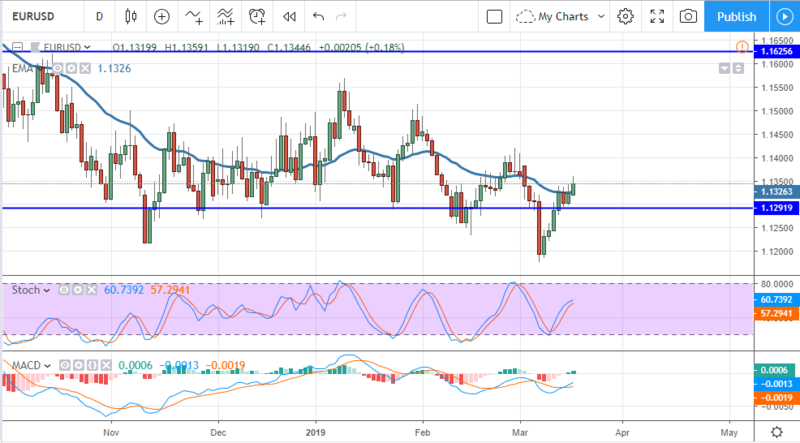 The EUR/USD has been gaining strength over the past two weeks and may be going higher. The pair has bounced off of a major support zone between 1.1200 and 1.12500 and is now indicated higher. The pair is above the short-term moving average with bullish momentum and stochastic so a move up looks probable. The risk is in the FOMC meeting so caution is due before then. A move higher may go as high as 1.1400 or 1.1500 before hitting major resistance. support is near 1.12500 at this time. 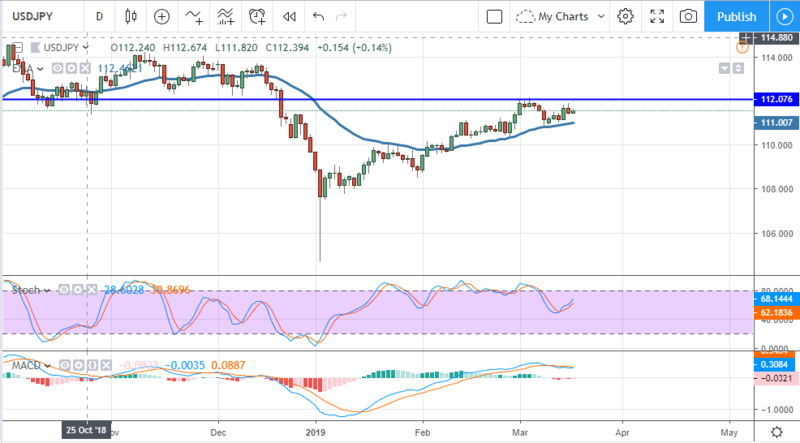 The USD/JPY has been trending up over the past two months and now wrestling with resistance. Resistance is at the 112.00 level and possibly strong. The indicators are weak but bullish and price action is supported by the short-term moving average so a move up looks likely. A move above the 112.00 level would be a trigger to buy and could lead the pair up to 114.00 or higher. If 112.00 is confirmed as resistance we may be looking at a complete reversal in prices, if that happens the first target for support is 111.00 and then 110.00.